Gpixel announces the release of GMAX3265, a high resolution (65MP) image sensor featured with the latest low noise 3.2µm charge domain global shutter pixel architecture. GMAX3265 offers 9344 (H) x7000 (V) charge global shutter pixels with ultra-low read noise of <2e-, >70dB dynamic range, and 1e-/p/s dark current at room temperature. Thanks to the light pipe technology, the sensor exhibits excellent shutter efficiency of 1/30,000 and large angular response. Consisting of 56 pairs sub-LVDS data output channel and each running at maximum 1.08 Gbit/s, GMAX3265 delivers 85 frames/s at 10bit output or 53 frames/s at 12bit output. The high resolution and fast frame rate significantly increases the system throughput for industrial inspection applications, such as semiconductor, PCB, AOI or display inspection. Similar as GMAX0505, GMAX3265 is designed with on-chip sequencer supporting various exposure and Regio of Interest modes tailored to inspection imaging needs enabling easy and cost-effective integration for camera manufactures. Gpixel has also expanded its Gmax product family with the addition of two new 2.5 µm global shutter sensors designed for c-mount camera applications. The GMAX2505 is a 5MP, 2600 x 2160 resolution 1/2” sensor while the GMAX2509 is a 9MP, 4200 x 2160 resolution 2/3” sensor. These two new devices follow on from the introduction of the 25MP, 1.1” GMAX0505 earlier this year. Gpixel’s GMAX c-mount line up are all pin compatible and use the same global shutter pixel family architecture. This is based on the world smallest, state-of-the-art 2.5 µm charge domain global shutter technology, which delivers an ultra-low read noise of less than 1.5 e-RMS and results in a dynamic range of more than 70 dB. They also include advanced in-pixel light pipe technology for a shutter efficiency of 1/10000 and excellent angular response. Offering full resolution frame rates of up to 292 frames per second (fps) at 10-bit output and 121 fps at 12-bit, both the GMAX2505 and GMAX2509 can support the 12-bit frame rate with half the LVDS data output pairs providing added flexibility in the choice of system FPGA. Housed in a compact 22 x 17.5 mm LGA package where the optical center matches the mechanical package center, makes them a perfect fit for 29 mm mini cube cameras. 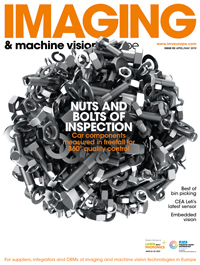 All together the GMAX2505 and GMAX2509 are ideal for high resolution industrial inspection, machine vision, intelligent transportation systems (ITS) and professional imaging applications such as 4k video.